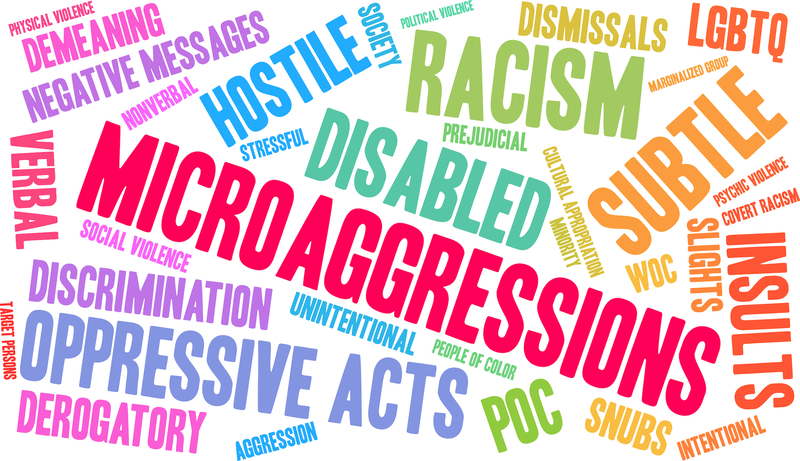 By now, you’ve probably heard of the term “microaggression.” Simply put, a microaggression is a seemingly innocent remark or gesture that is actually quite offensive to the recipient. Below is a list of some common examples. Everyone has been guilty of interrupting someone, but all of us should make an effort to stop doing it. Why? Because interrupting someone sends a signal that whatever you’re about to say is more important than what the other person was trying to convey. In one study, Slate contributor Kieran Snyder found that men are nearly three times more to likely to interrupt a woman than another man. Although it may be well intentioned, complimenting a person of color for being “well-spoken,” has a subtext to it that is quite demeaning. Christine Mallinson, who teaches language, literacy, and culture at the University of Maryland, explains why the comment is so insulting. “When a white colleague tells a colleague of color ‘You’re so articulate’ or ‘You speak so well,’ the remark suggests that they assumed the person in question would be less articulate—and are surprised to find out they aren’t,” Mallinson told Business Insider. “(T)hey assume if I’m trans, my ultimate goal must be to look as much like a binary cis male as possible—and that trans masculine folk who don’t look like cis men have somehow failed that unstated goal,” Wake told Bustle. There are countless other examples of microaggressions out there, but these are just a few of the most common. Our suggestion is to reevaluate the ways in which your implicit bias is being expressed through your words and actions, and make an effort to curtail that behavior.